FOREST, ON – A new farm-based brewery has announced that it is opening today (August 30th) just outside of Forest, a small community in the municipality of Lambton Shores in Southwestern Ontario. Stonepicker Brewing has been founded by two couples – Joe and Mary Donkers, and Jim and Laura Soetemans – on the Donkers’ farm. According to a recent profile in the Sarnia Observer, Joe and Jim began homebrewing several years ago, and they have spent the last two years converting the farm shop into a brewhouse and taproom. 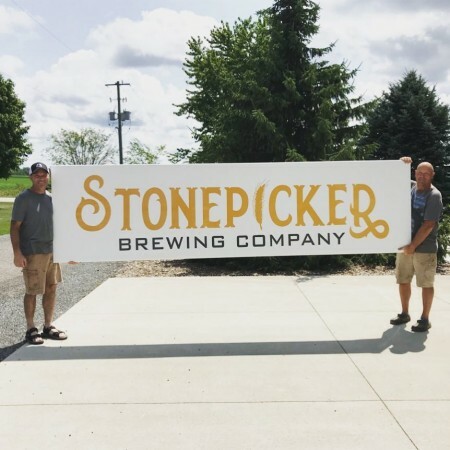 Stonepicker will offer six year-round brands – including Oops It Fell Out Lager (5.75% abv), Farmer’s Tan Blonde Ale (5.5% abv), Stonepicker 21 Amber Ale (5.5% abv), Tractor on the Wall Oatmeal Stout (6% abv), Big Red 9350 Red IPA (6.25% abv), and Hack & Slash IPA (6.4% abv) – as well as a rotation of seasonal beers. Many are brewed using barley grown on the farm, as well as hops from local producers. Stonepicker Brewing is located at 7143 Forest Road, 4 km south of Forest on Highway 21. Initial business hours for retail and taproom sales will be 11:00 AM to 7:00 PM on Thursday, 11:00 AM to 11:00 PM on Friday and Saturday, and 12:00 noon to 5:00 PM on Sunday. For more details, see the Stonepicker website and Facebook page.